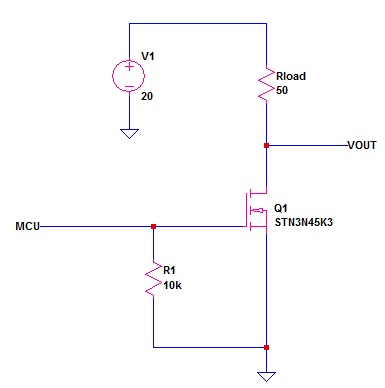 In this article I will discuss the proper way on how to use MOSFET RDSon data provided by datasheets. RDSon is a channel on-state resistance of MOSFET. This is provided in the data sheet taken from different conditions like below table. 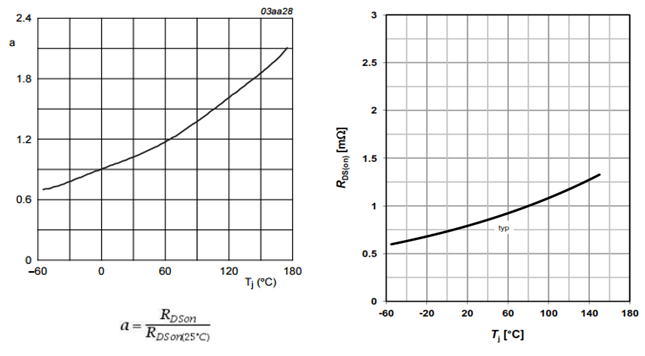 There is also a graph between RDSon or normalized RDSon value and temperature like below. 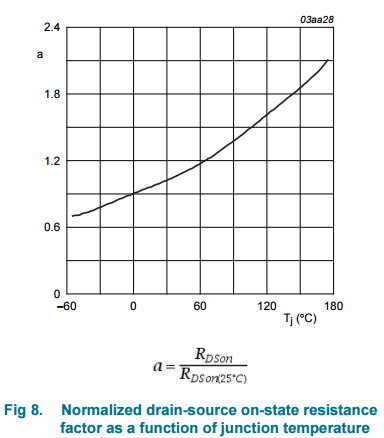 Normalized RDSon is actually a temperature coefficient of the drain on state resistance (RDSon). A dedicated article for this is here. What RDSon I should select? Well, you can go for the worst case for quick design analysis. However, if you want to know how to use MOSFET RDSon data that is more realistic, continue on reading below. As mentioned above, you may consider directly the worst case scenario for easier analysis. However, the result is not that realistic with respect to your needs. For instance, the worst case RDSon using below table are 2.8 ohms and 9.25 ohms. To compute for the drain current, the worst case is the smallest value since it will give the highest drain current. In solving for the power dissipation, the worst case is the highest value. The more realistic approach is to consider a single RDSon corresponding to a particular condition. For instance, the design maximum operating temperature is 60’C ambient; then get the corresponding RDSon for this. For 2N7002, I see the graph below. It seems perfect for the requirement. From the graph, I get 3.5 ohms. However, this is only taken at a junction temperature (Tj) of 25’C. Our target is to get the RDSon at 60’C ambient. From the datasheet, I also see this graph. This is a normalized RDSon with respect to junction temperature. 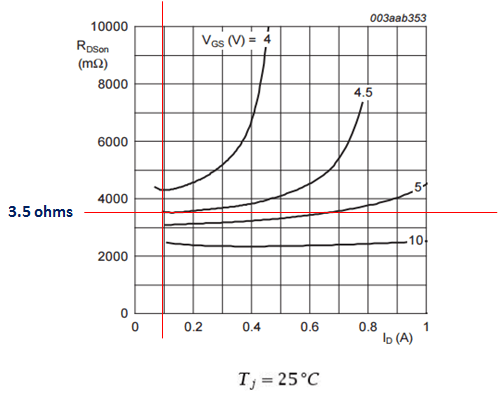 The value we derived above which is 3.5 ohms will be multiplied by a factor that is found on this graph. My objective is to get the RDSon at 60’C ambient; can I use the information at the junction temperature of 60’C on the above graph? It’s better not. 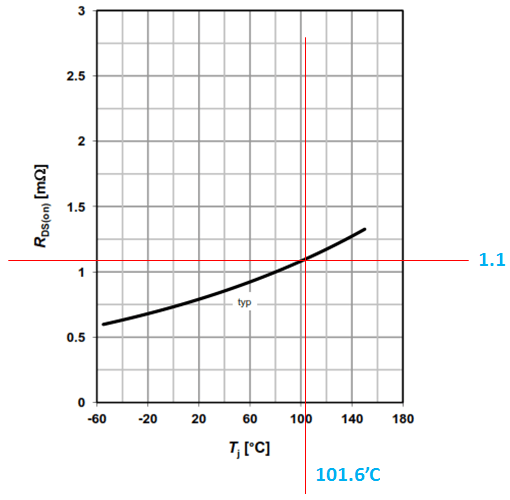 There is a relation between junction and ambient temperatures as given by below equation. Finally, we get the delta temperature between junction and ambient. So, for an ambient of 60’C, the equivalent junction temperature is 60’C+12.25’C = 72.25’C. The multiplier we need is 1.2 based from the graph below. In this second example, I will show you the way on how to use MOSFET RDSon data for STN3N45K3 N-channel MOSFET from ST Microelectronics. Our circuit uses MCU pin voltage to the gate. MCU pin is can be 3.3V or 5V. 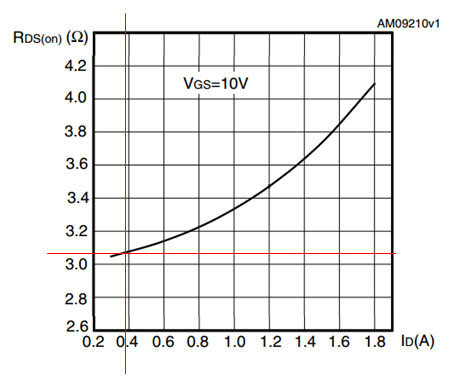 The table above specified RDSon value that is taken at VGS = 10V and ID = 0.6A. 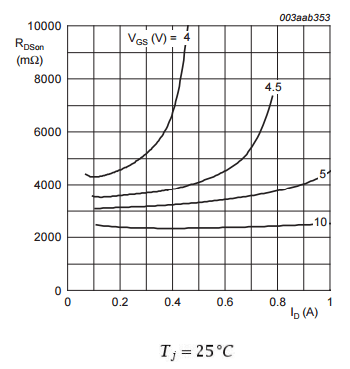 The graph also shows only a curve with VGS = 10V. If you want to, you can ask another curve from the manufacturer specific for your needs for more exact analysis. In my case, I just make use of these informations. 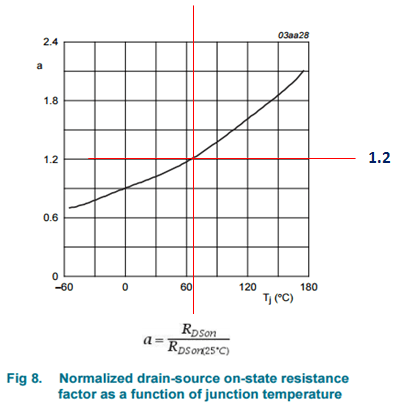 If you want, you may not consider the RDSon in the estimation of the drain current. If so, the computed drain current is just equal to 0.4A. 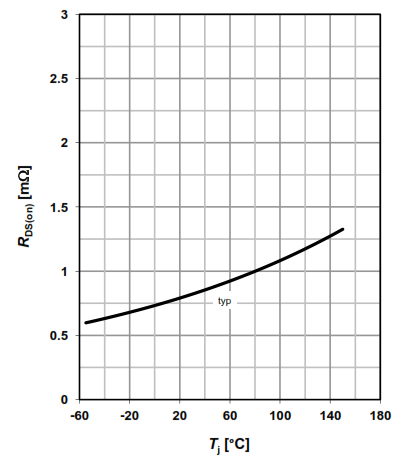 From the drain current versus RDSon graph, the RDSon is around 3.08 ohms when the drain current is around 375mA as shown below. This value is just for junction temperature of 25’C as datasheet said. Our goal is to get the RDSon at 100’C ambient temperature. Again, we need to solve for the temperature difference between junction and ambient as we did on the first example. So, for 100’C ambient, the equivalent junction temperature will be 100’C+16.4’C = 116.4’C. Based from the normalized RDSon curve, the multiplier is 1.9. 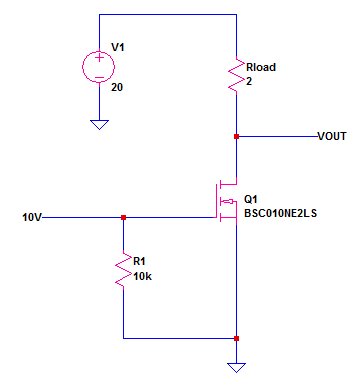 In this last example on how to use MOSFET RDSon data, I will use a power MOSFET in a circuit below. 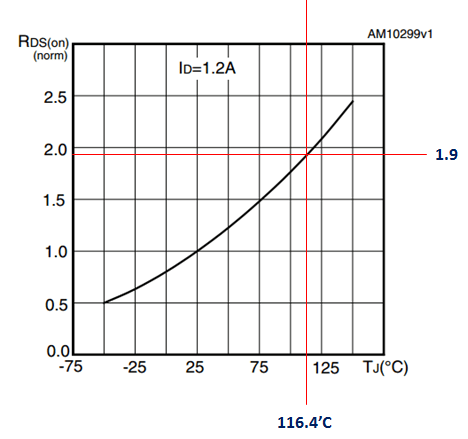 The requirement is to get the MOSFET RDSon at 100’C case temperature. First we need to get the drain current using the typical RDSon. The typical RDSon of this device based on datasheet is very small which is 0.001 ohm; it can be neglected in solving for the drain current. 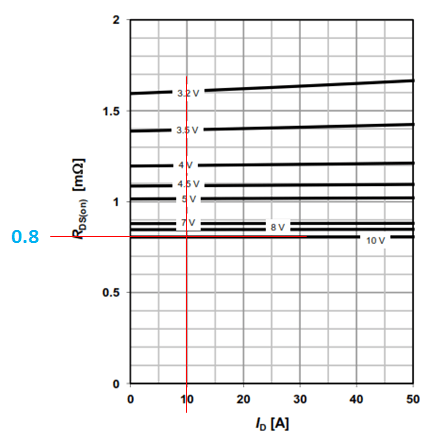 From the drain current versus RDSon with VGS of 10V, the typical RDSon is 0.8milliohm as shown below. The RDSon we get above is typical. So, we need to use the normalized RDSon table below to get the target RDSon. The difference between the junction and case temperatures is only 1.6’C. So, for 100’C case, the equivalent junction temperature is 100’C+1.6’C = 101.6’C. Now, we can use the normalized RDSon graph to get the required RDSon. What I demonstrated is how to use MOSFET RDSon data from the datasheet using the detailed approach. There are lot of assumptions as well during the process. In some cases, I am not doing this long method instead go directly for the worst case for easier analysis. If I pass on worst case, I pass to all conditions. However, there are some scenarios that I need the more realistic value of RDSon for instance to compute the efficiency of the circuit. Based on experienced, using the worst case RDSon to efficiency calculation will give huge error compared to the measured efficiency. The long and detailed approach gives the closer result. If you don’t after for this detailed calculation (for example only aiming for stress), you can simply use the ready given worst case RDSon value. You may not mind to derive the difference between the junction and case or ambient temperatures as well if you have huge margin in your design and this simplifies the calculation.